Alexey’s journalistic pursuits began in the early 1970s, when at just 13 years of age he published his first article. In the Soviet era, his career focused predominantly on sports journalism, which was largely devoid of political interference, and Alexey has reported on major sporting events, including the Olympics. 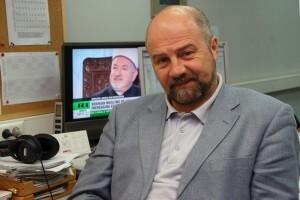 During the Perestroika, Alexey began to cover general issues and in 1990 joined Russia’s first ever independent radio station Echo of Moscow, where he soon became a news anchor and a reporter. For this station he covered some of the most important events of the 90s in Russia, including the August Coup of 1991, the October 1993 Constitutional Crisis. Alexey joined Russia Today (now RT) in 2005 and is now the Managing Director for the entire organization, including English, Arabic and Spanish channels.